Come out this Saturday to the market! Posted 9/8/2011 6:47am by Gregg Keckler. PLUMS! We have MANY varieties of plums. Red Heart and Blue Ribbon and Stanley! PEACHES! THE BEST! Very Sweet! Peaches are winding down. Get them NOW! Spaghetti Squash! Acorn Squash! Butternut Squash! Posted 9/6/2011 8:21am by Gregg Keckler. I’ve really been enjoying my first CSA experience…you all run a great operation! Place the kale, celery, banana, apple juice, ice, and lemon juice in a blender. Posted 9/5/2011 11:12am by Gregg Keckler. We survivied the hurricane last weekend. We only lost a few large trees on the fence row. Gregg and Oliver were cutting them down last week. We burn wood in the winter so at least they will get used. We have been picking apples. Many Many apples! The Honey Crisp, Ginger Gold, Rambo, Smokehouse, and some Gala and Macintosh have been picked. We are still picking peaches and nectarines. They have been very good this year.Oliver is digging carrots, parsnips, and turnips. Gregg is still picking raspberries and blackberries. Unfortunately we have a serious blight in the raspberries. So we are going to be plowing them up this fall and letting the ground rest. We will replant raspberries and probably some more blackberries at a new location next spring. It is actually a good thing in the long run. It is more work for us now, but it is better for the soil to replant and also we will get bigger and more raspberries. We are making apple cider beginging next week. Everything is about a week early this year. We started picking winter squash the last week of August. This year is not a good year for spaghetti squash, but we have tons of butternut squash to make up for it. We are planning to have a winter CSA program this year. Stay tuned for more details. It will be a home or office delivery and we will have an order form so that you can order whatever we have available. We should have pumpkins, winter squash, potatoes, apples, pears, jelly, and certain vegetables like broccoli and cauliflower and brussel sprouts at least through Christmas. We should have beef and some eggs and we will offer Ed's cheeses as well. We will give more details as they develop. We hope you are enjoying the change in weather and the beginning of the fall season. We are about to start our fall CSA session. If anyone would like to get in for it, send me an email ASAP. If you are scheduled to begin the fall session, I will be sending you an email with details at the beginning of next week. Cook up some apples for sauce. The sauce is very good this year and the smell of cooking apples will warm your heart! Posted 9/5/2011 9:04am by Gregg Keckler. This is the last week of the summer session. For some we are saying goodbye until next year. We hope that you have enjoyed our CSA experience this year. Join us again next year when we will do it all over! For those who are in it for the duration - we have good things to come. We will be making cider next week. We are picking lots of apples and the concord grapes are smelling delicious. This week's share will included: Honey Crisp apples, sweet corn, peaches/necatrines, peppers, chard/kale, broccoli, cucumber, mystery item. The Honey Crisp apples are mazing - very sweet, very crisp. The sweet corn is Mira - very sweet. If you get tired of kale - try kale chips. Toss the kale leaves with a bit of olive oil and some garlic salt. Put on a baking sheet in the oven at 350 until the kale is crunchy. Eat it for a snack. You will never go back to potato chips again! We are just beginning to pick broccoli and cucumbers are at the end. Enjoy the last of summer and anticipate the fall. I have been making applesauce. The smell of cooking apples brings back good memories for me. The sauce apples on the extras list are either Summer Rambo or Smokehouse apples. Both are excellent for a nice tart sauce. I love eating this sauce hot with cheddar cheese crumbled over it. Delicious! If this is the last pickup for you, please return your boxes to the drop off spot next week. Our driver (Ken Roberts) will stop by next week to pick them up. Remember to return any empty jars and fruit boxes. Posted 9/1/2011 6:50am by Gregg Keckler. We are into the height of the harvesting season. Come out and enjoy fresh, LOCAL produce. PLUMS! We have MANY varieties of plums. Black Friar, Red Heart, and Blue Ribbon, Stanley! PEACHES! THE BEST! Very Sweet! Posted 8/29/2011 9:52am by Gregg Keckler. September 2 is the deadline to sign up for the fall session. If you have not signed up, please let us know by THIS FRIDAY September 2 if you would like to continue into the fall session. We will be having some great winter squash. We picked some acorn squash this week. Oliver wants to pick the Delicati soon. We are picking lots of apples. We will start off the last session with Honey Crisp apples! Oliver and our two field workers picked them before the hurricane hit. Thankfully, otherwise they would have dropped. Gregg is hoping to do a batch of cider next week. We are picking Gala and Jonathan apples this week. 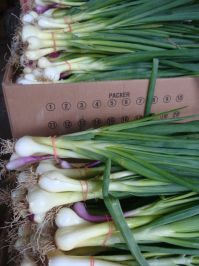 We will have onions into the fall and potatoes, sweet potatoes, turnips, beets, Italian plums, concord grapes, Roma tomatoes and much more. Stay tuned! This week's shares will include: peaches, pears (Bartlet), plums acorn squash, sweet onion, mystery vegetable, kale/Swiss chard. Our tomatoes have slowed down with all the rain this weekend many of them are split. We are cleaning off the plants and hoping that new tomatoes will come on before the weather gets too cold. Enjoy the acorn squash this week. They are great roasted! Have a great week - Enjoy the last of the summer birds and butterflies. We are beginning to see flocks of wild geese instead of robins. Fall is in the air! Posted 8/22/2011 11:37am by Gregg Keckler. This week's shares will include: sweet corn, nectarines, tomatoes, peppers, sweet onions, apples, and mystery item. The deadline to sign up for the Fall session is SEPTEMBER 2. Please let us know by that date if you plan to participate. If you have not paid up your extras bill for the spring session, please do this ASAP. Oliver has now butchered all his chickens. They are free-range, grass and bug eating chickens. They weigh between 3-4 lbs. Get them while they last! A word about sauce apples. I have been making some great sauce from Summer Rambo apples. It makes a nicely tart sauce. You can also make sauce from Ginger Gold apples. They would be naturally a bit sweeter. Making sauce is very easy. After it is made you can freeze it, can it or just eat it as is. It is great knowing that you made it from real apples in your own kitchen. So you know whose hands were on it and how clean everything was! A near neighbor of ours has 5 acres of full grown apple trees. Several years ago he decided to go "certified organic" in his farming practices. (No spray of inorganic chemicals) His productive trees rapidly deteriorated into an apple orchard infested with various "scabs" (fungi which blemish the exterior with black blotches) and borers (insects which will feed on the apple itself - IE worms) These pests will eventually damage and destroy the trees much as certain uninhibited bacteria would damge our bodies. This past winter, Pete asked me if I would take over the care of his orchard. Knowing the pre-existing problem and dealing with it can be an interesting dilemna. I did not treat the diseases seriously enough and as a result some of the varieties are still suspect to damage. Even after thinning (the process where excess or damaged small fruit is removed in late June/early July so that healthy fruit may fully develop and size up.) there still remained a fair amount of scab. Scab is particularly bad when there is a lot of early spring rain as the fungus spreads rapidly with added moisture. As with any learning curve, I hope to do better with Pete's apples next year. Relatively speaking, I'm pretty happy with the results, considering the magnitude of the problem. One neighbor about 2 miles from us expects an 80% loss on his orchard due to scab infection. With that being said, I'm suspicious when some merchants sell their fruit As "organic" yet their fruit looks every bit as nice as ours. Pete's "organic" apples were unsightly and unsellable. (He could not even get the processing plants around us to take his fruit for sauce or cider.) In low stress regions or isolated environments some apple varieties can do well organically, but the vast majority of apples would not. Posted 8/18/2011 6:09am by Gregg Keckler. PLUMS! We have MANY varieties of plums. Santa Rosa, Red Heart, and Blue Ribbon! We have HEIRLOOM TOMATOES - Purple Cherokee, pink Brandywine, Germanhead, Lemon Boy, Beefsteak, Black Tula, and many others. PORK - We have free-range pork for all occasions. 7 inch links for the grill, and our own pork bologna. This bologna is very smooth and deliciously sweet. Posted 8/15/2011 9:04am by Gregg Keckler. This week's share will include: peaches, Ginger Gold apples, tomatoes, basil, sweet onions, watermelon, and of course the mystery item. We are having a great year of peaches. They have been very sweet and juicy. Ginger Gold apples are a good, sweet eating apple. The tomatoes keep coming. Some of the heirlooms are beginning to wane. Heirloom tomatoes are special because they are so sweet and full of tastel. They are also determinate which means they will only produce for about a month or 6 weeks. Then the plant dies back. That is why heirloom tomotates are so heavy in late July and the month August. By September we still have some because we try to plant some later in June for a late crop in September. The red tomatoes are indeterminate. They can produce indefinitely as long as they get water, sun and warm weather. So Enjoy the heirlooms now! I know they get spots and they do not hold up as long, but use them in salads. They are great with basil, onion and white vinegar and honey. I was using them in scrambled eggs last week. I also cut out the bad spots and threw them in the blender and made a V-8 juice with salt, Worchestershire and a drop of hot sauce. There are so many varieties of watermemlon out there. Gregg keeps trying new varieties each year. So you could get a red seedless, red seeded, an orange seeded, yellow seeded or just about anything! I confess that I am not savy with computer stuff. (I have about 50 new pictures in the photo gallery on the website and I can't remember how to get them tastefully arranged so that you can see them.) But for those who follow facebook, you can "like" our new facebook page. Virginia and Oliver created it and are updating it now. I hope I can keep after it when Virginia goes back to college in two weeks. There will be updates regularly and pictures. Have a great week. Notice the butterflies and the humming birds! They are prolific!